This is a special guest post by Danielle Bell. Most people don’t love the number 13, but I find it quite encouraging as I think about Group’s KidMin Conference. I’ve been to every KidMin Conference and they never disappoint. Each one has it’s own special viewpoint and I so appreciate all the ways each conference challenges, inspires, and encourages me. 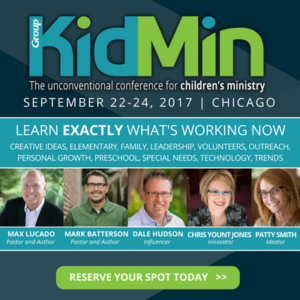 As I look to this year’s KidMin Conference in Chicago (September 22-24, 2017), I came up with 13 things I love about KidMin that I think you will love, too! Jesus-Centered – This is the very core of the KidMin Conference. I love that as they plan, they keep in mind that no speaker, leader, or musical guest is the star of the conference – Jesus is the only star. Relationships – In a ministry world that can often leave you feeling isolated, the KidMin Conference does everything they can to combat that. I also say if you don’t leave KidMin with new friends and at least five new ministry contacts, you weren’t trying. Learning– From the General Session stage to workshops you will be challenged by innovative, in-the-trenches ministry leaders that use Group’s R.E.A.L learning approach. R.E.A.L. makes sure you not only grasp concepts being taught, but you experience them and you can immediately apply them when you arrive back at your church. Relaxation – Sometimes it is just good to get away and hang out in bean bag chairs and talk life, or be still and not talk at all. There is no pressure at KidMin, participate as much or as little as you need. This is your conference and you make your schedule and the one thing you might need most is a nap! Renew – We have all reached a point where we just want to quit. Sometimes it takes simple reminders about our calling and a chance to have our soul renewed to continue to be faithful. The KidMin conference speakers are honest and transparent about their struggles and provide a safe place to share and be renewed. Connect Groups – This is a unique time of two-way conversation in a group you choose to be a part of like: KidMin Veteran, Discouraged in Kidmin, etc. These informal times of discussion can really help put feet to big ideas you hear in breakouts and can also be a breeding ground for life-long friendships. Ministry Conversations – Have you ever wanted to go a little deeper in a ministry discussion and maybe even ask a question or two? Ministry conversations are made up of seasoned panelists from all walks of ministry. This is not only an informative, but a fun time as you are a part of the conversation. Connect with speakers – As I stated above, Jesus is the star of the conference so everyone is on level ground from participants to keynote speakers. I love that you can grab a cup of coffee or have a discussion in the hall with someone you just heard speak. There is a whole “we’re on the same team feeling” at KidMin and an opportunity to realize those you look up to are in the trenches alongside you. Counsel – Ministry can often make you feel like you are doing life in a fishbowl with few people who you trust with your deepest hurts or fears. That’s why I love The Shelter at KidMin. Maybe you don’t have time or the money for counseling at home, so KidMin provides a safe place to receive Bible-based counseling or even ministry coaching. Laugh – When was the last time you could sit in a service with no responsibility outside of the room and just laugh? That’s what KidMin provides, a chance to just let go and surround yourself with like-minded ministry friends and experience true joy! Ministry friends that feel like family – This is one of my favorite things about KidMin. The relationship focused atmosphere has provided me with many opportunities where I not only met new ministry friends, but got to know them on a personal level. These have become people I chat with throughout the year asking for advice, ideas, or just catching up with them in their personal life. KidMin often feels more like a family reunion than a conference. Worship – You don’t have to check your cell for messages or the screen for numbers, you can simply sit back and worship. With the Jesus-centered worship at KidMin you can begin and end each day at the feet of Jesus and leave changed as you head back home. Hope to see you at KidMin Conference this year. Register before August 20, 2017 and save $50. thank u for posting this conference, because of your post I am now going to this great event and soooo looking forward to it. It couldn’t have appeared to me at a much needed time and I know it was God’s hands at work, my prayer has been answered. Thank you for being one of God’s tool… You are AWESOME!! This is my third year going and I simply can’t wait. Every single thing you said above is so very true!!! I would encourage anyone involved in Children’s Ministry to attend :) It is not just for “big” churches too, my church is on the smaller side. There is something for everyone. Tony Kummer (Editor) reviewed & updated this page on : August 11, 2017 at 12:37 pm. All our content is peer reviewed by our readers, simply leave a comment on any post suggest an update.